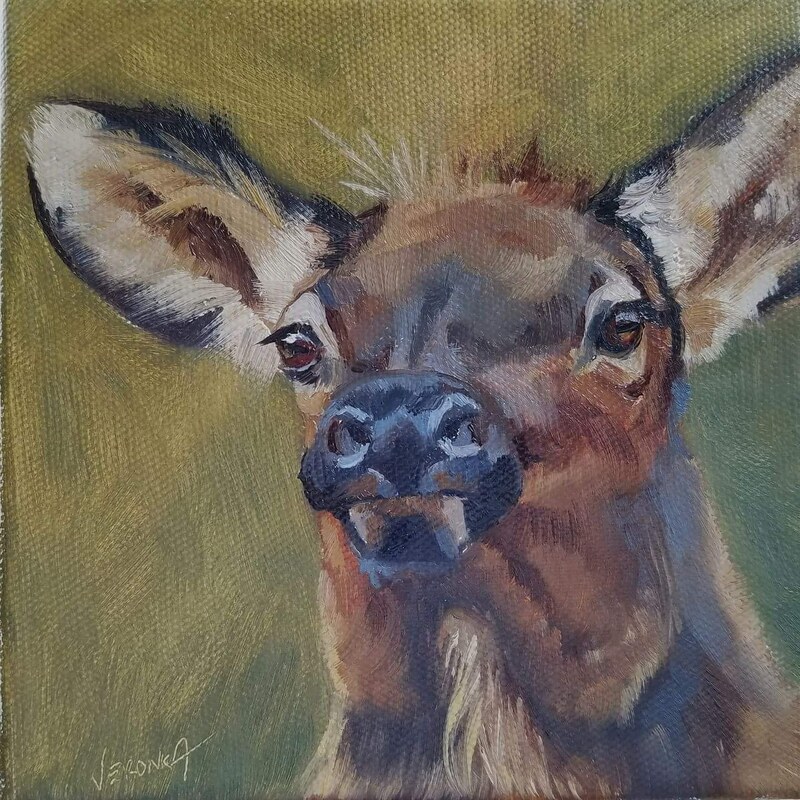 Veronica Brown's Art | "Come Take a Walk in My Boots"
"Come Take a Walk in My Boots"
“Growing my Network” – Giveaway!–2 hours left to enter…. In an effort to reach an personal goal of 50-100 newsletter subscribers, I’m offering a giveaway. If you sign up to receive my e-newsletter between now and Jan. 1st, 5PM CST, you will be entered into a drawing to receive your choice of one of the following two 6″ squared paintings. I promise not to “clog” your inbox and the plan is to send a newsletter out monthly. Good luck and please pass the word! Mastodon State Historic Site–hmmm, what to paint here? Well, the most recognizable icon for the park would’ve been the mastodon skeleton in the museum but…. 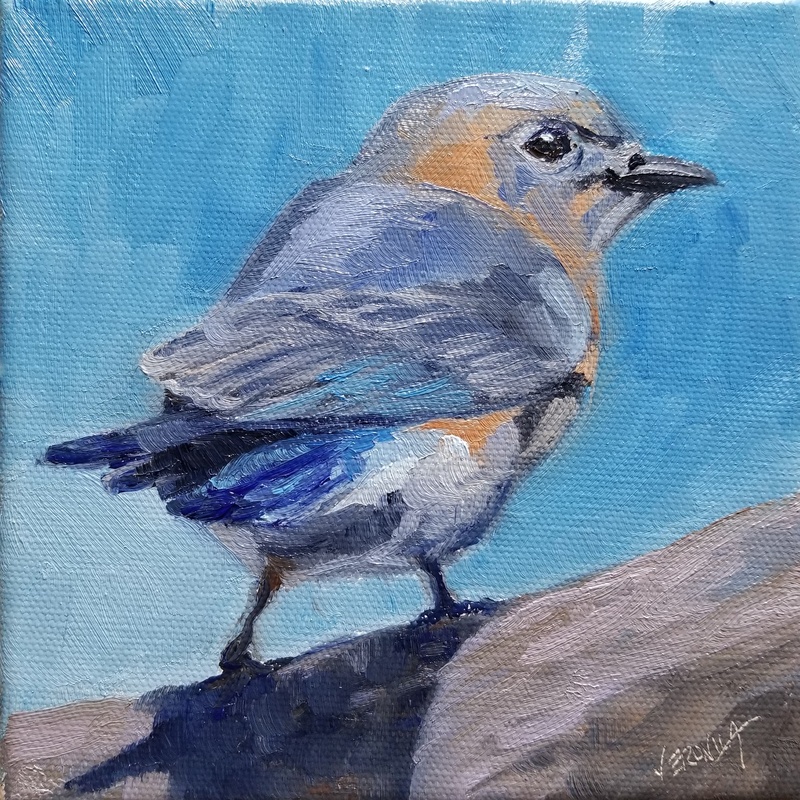 I wanted to paint “en plein air” and felt since I didn’t have prior permission, it might be a hassle to set up and paint inside the museum–if it would even be allowed. Maybe one of these days I’ll call ahead and see if painting inside would be allowed…if not, I may try to paint from some photos I snapped. It seems like a fun challenge. So, the next best thing, I thought, would be the bone beds, the site of the archeological digs where the mastodon bones were found. After finding out that you can’t really “see” the bone beds or at least they’re not really marked to protect future finds, I chose to set up along the trail, in a spot where the light really struck me and where you could see some of the ancient rock of the site. For our second park adventure weekend, mom and I chose to head southeast, talking my mom’s sister into tagging along with us. Our first stop took us to Sandy Creek Covered Bridge. A perfect morning for a stop at this historic, red historic covered bridge. One of only four remaining in the state and our second covered bridge site. We had a perfect, idyllic fall morning to be there. We arrived with only one other car in the lot, who left shortly after. We walked the grounds a bit as I honed in on the view I wanted to paint. I settled on the view with the white fencing leading into the entrance, set up, and quickly went to work while my mom and aunt walked around and explored the grounds. It seems that Sandy Creek Covered Bridge is not only eye candy for a painter but it is a sought after location for photogs taking family pictures. As I was finishing my painting, photog after photog showed up along with their families, causing some to wait in line for their turn to set up and take their pictures…..the park was getting busy, the peaceful fall morning was gone, time for us to move on to our next location. Next up, Mastodon State Historic Site. We ended our first park adventure, with a stop at the Trail of Tears State Park. A bittersweet place. The views from the overlooks were beautiful while the historic displays and accounts of hardship and death along the forced relocation march-particularly, the delayed crossing of the Mississippi River during winter, was a tragic reminder of one of the saddest times in American history. While wanting to depict something specific to the park and what had happened in this area in 1838 and 1839, I settled on the view from the overlook. It was peaceful. The view was a perfect place for reflection while I painted. So, back to mom and I’s challenge, we officially started our adventure by heading down to Burfordville and Jackson Missouri to visit Bollinger Mill and Covered Bridge and The Trail of Tears State Parks. We couldn’t have picked a better day for it. The colors are starting to show as fall slowly comes to southern Missouri and the temperatures were in the mid 70’s—my idea of perfect! We started out with a tour of the mill and bridge, while I absorbed my surroundings and tried to decide what I wanted to depict. 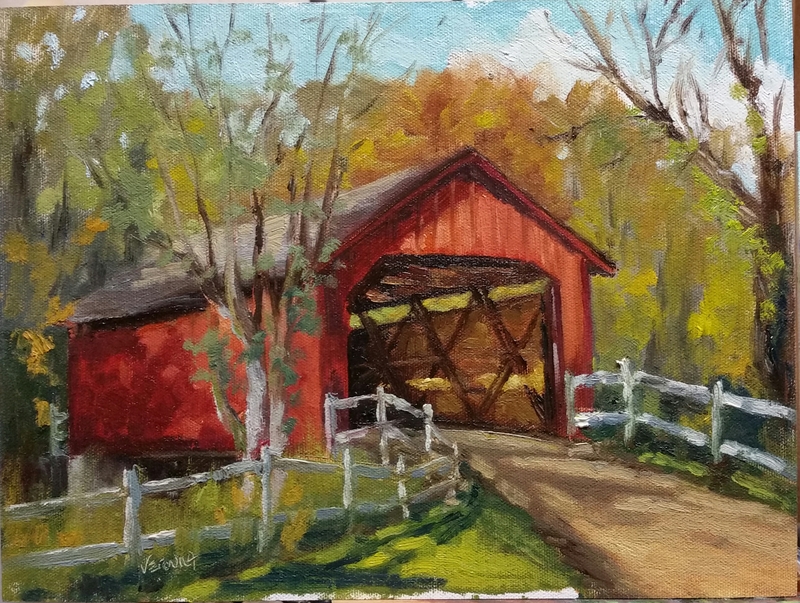 I finally decided I was going to paint from inside the covered bridge, looking outward, but, it appears there were several photogs taking advantage of the beautiful day and with similar ideas. 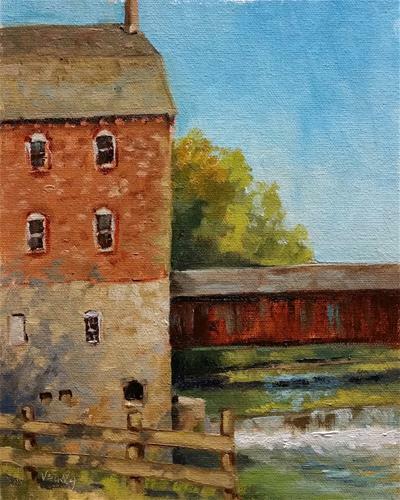 So, not wanting to be in the way and to make sure I shared the park, I chose to paint the little falls by the mill with the mill and covered bridge in the painting as well—all of the elements that Bollinger Mill is known for. I set up my easel and went to work—on a time clock of sorts, as there were chairs, an arbor, and aisle set up for a wedding to happen that day. I wanted to be finished before they party arrived so I wasn’t in the way or caught in some photographs. All the while I painted, for some reason, I had Billy Idol’s song, “White Wedding” in my head. Funny how songs just pop into your head while you’re painting. I don’t think I sang any of the lyrics out loud but, can’t promise that I didn’t hum part of it while I was “in the zone”. I’ve begun a new personal challenge……and I’m taking my mom along with me! In light of 2016 being the centennial of the Missouri state parks, I’ve decided to try and visit as well as paint en plein air at each park. I hope to finish this challenge in 2 years, but we’ll see. It may take longer (there are 88 places to visit! ), but in the end, the real goal is to learn more about the history of our great state and to see some beautiful country along the way. The other driving force behind this goal; my mom confessed to not really visiting many of the parks or really traveling Missouri much—OK, we need to change this! Challenge accepted! 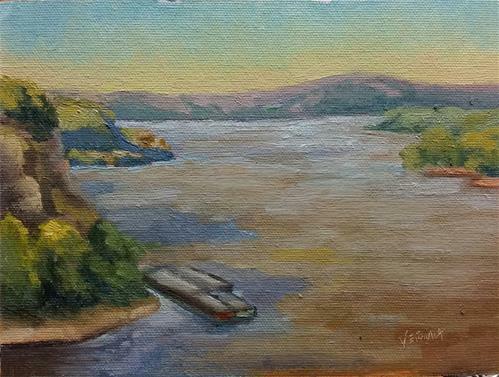 I, myself have visited a lot of the state parks through the years and even painted at a few of them the past couple of years, as I’ve become more involved in painting en plein air. 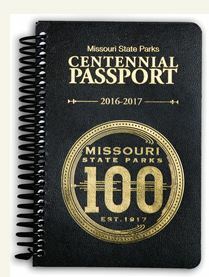 I only became aware of the “passport” book this past summer, after a friend was telling me about these little books that listed all 88 state parks and historic sites in Missouri and encouraged people to get their “passport” stamped at each park they visited. This got me thinking, how fun would it be to paint at each park while mom and I were earning our stamps! How cool would it be to finish the passport with 88 little paintings reminding us of our travels and adventures?! Again, challenge accepted! Now, I’m not claiming to be anywhere near Billyo’s artistic level, nor will the resulting travels end in a book or gallery tour, but, I think the result will be interesting in it’s own right and will carry with it a great sense of achievement and hopefully result in some wonderful memories! I think it will be fun to see the personal growth through the paintings after they’re all lined up at the end of the adventure–hopefully my skills will be noticeably better! I think it will also be fun to see what caught my eye on each particular day and what I chose to depict for that park visit. To follow along on mom and I’s adventures…..stay tuned and I hope you enjoy the journey as much as I’m sure we will! Plein air at Tower Grove Park- Wait, my subjects left!?! What do you do when your subject leaves before you’re finished painting???? I recently took a workshop with Dave and M. Shawn Cornell and the focus was on studying your subjects in sketch, paint, and just with your eyes and mind–committing as much as you could to memory. The logic behind this is so you can “paint what you know”. To drive the concept home, we did several Notan (small drawings used to establish balance in a painting’s composition) sketches of landscapes and views, totally from our mind. After doing several of these, we then chose one that seemed to be the strongest idea and worked on developing the concept. We did more detailed Notans if the scene, detailed Notans of the details of the scene, and then small color studies of the scene. Finally, we did a larger painting using only the reference materials and studies we’d made. Normally what we found, is that the scenes were places we recognized, saw on a daily basis, or favorite places that have been committed to memory because of our fondness for the location. This was a tough exercise for a lot of us (including myself), but it would turn out to be a great exercise that I would put to use, sooner than later. If you’ve been following my blog, you’ll know that I had been doing the “painting a day challenge for the month of March”. I’ve been trying to limit my time on these little studies each day, to one hour….or at the most an hour and a half. Each week, I sort’ve changed subjects or themes. 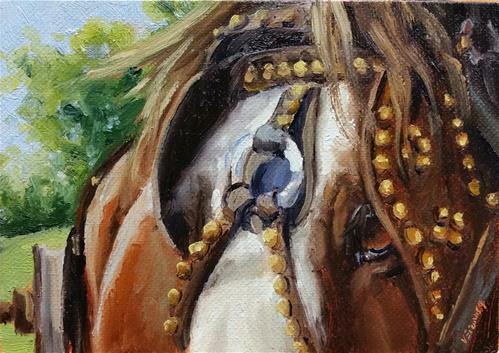 One of the last weeks, I was painting horses. I’ve been drawing and painting horses since I can remember but, I still needed practice in getting them down quickly and correct so, these studies were proving to be great exercises for me. Last Sunday, I went to Tower Grove Park to paint with members of the MOPAPA group. I painted a flowering tree first thing, then I migrated to a pavilion to eat lunch with a few of the members. As I was walking up there, I saw a Clydesdale hitched to a carriage and the gentlemen driving him was there to give carriage rides to the park visitors. I took a few pictures, chatted with the driver a bit and went on for lunch. After lunch, we decided to set up and paint one more painting before calling it a day. I walked around and looked at the flowers and the ponds and kept coming back to the Clyde and carriage. Could I pull it off? Could I paint quick enough to get a gesture and idea of the scene before he went around for another ride? I decided to take on the challenge and setup my easel from across the pond from the carriage, where there were tulips in front of the horse. I started covering my canvas with a wash and started drawing feverishly, and there went my subject. He was only there for a few minutes before he started giving a tour around the gardens. Eventually he came back and I started painting like a mad woman again….he left about 5 minutes later. So, my quick draw studies and my exercises at the Cornell workshop started paying off. I started filling in what I remembered from studying the horse and carriage earlier while chatting with the driver. I also adlibbed a bit based on what I knew about horses and harness in general. I reached a point that I really needed to see the carriage again….so, I worked on the background, waiting for my subjects to return….except they never did. They were done for the day. So, what do you do when your subject leaves? Well, if you haven’t done any homework or studied your subject much, it’s going to be really hard to paint what you don’t know. So, you either have to surrender or hope to come back another day and hope for the same lighting and subjects. I had accepted the challenge and feel like I pretty much walked away winning. I’ll let you decide. 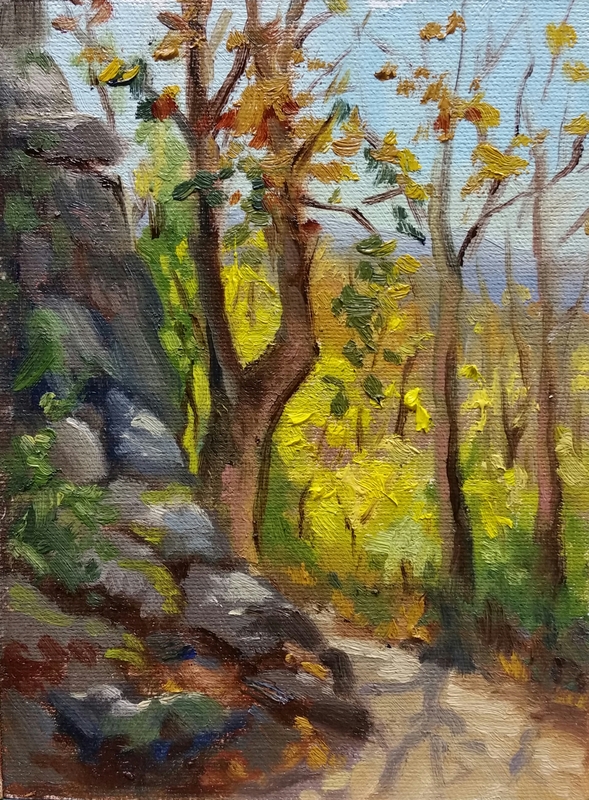 I have found, while plein air painting, that one of the biggest challenges is to focus on your subject and try to only include it and supporting detail. As a beginner, you see it all so you want to put it all in your painting. Squint your eyes…that is what most instructors will remind you. That does help….if I remember to do it. Maybe I need to remind myself to look at the subject with “blinders”. 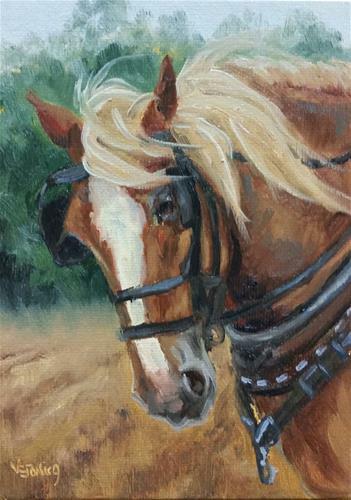 Blinders are meant to keep a horse focused on the road ahead and looking forward….kinda like plein air painting before the light changes. Here’s another in my series of draft horses. This guy had one blue eye and one brown eye….those blue eyes in horses are eerily beautiful. This painting is based on some photo reference I took at my uncle’s farm while he and my cousin were tetting (fluffing) hay so that it dries quicker, with a team of horses. I believe this big guy’s name was “Bud” and he was part Clydesdale–beautiful horse. In honor of April Fool’s Day, I’m going to post out of order…..that, and I had the “day 29” post all ready before I had day 23…..so, there’s that…. Spring has sprung and I have a renewed need to get outdoors and paint! Now, I won’t lie, I had the need to get outdoors to paint, even during winter–I love snow! However, something about the trees budding, flowers blooming, grass turning green, birds singing, peep frogs chirping, and warmer temps (I could go on and on….this is one of my favorite times of the year! )….I just want to be outdoors painting. After the time change, so that it stays light a bit longer….I try to get together once a week at one of our state or county parks with a group of painters and paint after my “day job”. It’s a great way to schedule a time to paint–if it’s on the schedule then it becomes a priority instead of “I’ll paint after I get everything else done.” This is also a great way to share a common interest among friends (to also meet new friends), offer encouragement, light critiques, and share tips and tricks. One of the locations we like to frequent is Shaw Nature Reserve. I am constantly in awe with each visit because it seems like there is always something new blooming. Right now, the daffodils are in full bloom. When I say daffodils–they have them! There are literally thousands of them blooming throughout the park. It is amazing and overwhelming at the same time. How do you capture that in a painting? Ho do you portray the volumes of flowers and still show the viewer that they are daffodils vs. some other yellow (and white) flower? Of course, not only did I have that dilemma but I was also drawn to the blooming trees that seem to be in their prime, flowering glory as well. I had sensory overload….and as my usual self, I attempted to put it ALL in right from the start. I should know better than that by now but, hey, it was all so beautiful. I will admit, I wiped off part of the painting not once, but twice. While the final result wasn’t exactly what I had in mind, I’m still happy with the study results and think I have enough there that it might be fun to paint it again…strictly from the study. A few hours of painting with friends, outdoors, on a crisp, spring day–perfection. This guy is one half of a big, Belgian team of horses that I “met” at a historic horse, mule, and oxen farming days. Such big, beautiful animals that seem to look graceful even when pulling a plow. Every time I see a team of Belgians, I think of my grandpa “ship” and the summers he kept a team and let me “help” with a few of the chores involving the horses. I was fascinated by those big, beautiful, blonde horses with the huge hooves. I remember watching him harness, hitch, and drive them as if he’d been doing it all his life…..oh wait, …..he had. What I wouldn’t give to have had a few more years with him to learn to drive a team like he did. “If I had the words, there would be no reason to paint”. "I found I could say things with color and shapes that I couldn't say in any other way - things that I had no words for." "To be an artist is to believe in life"
"When inspiration calls, don't send her to voice mail." "Self esteem comes from being faced with a challenge, whatever it might be, and meeting it. " "The secret of great photography is to create great moments from common things." "Ultimately, my hope is to amaze myself. The anticipation of discovering new possibilities becomes my greatest joy." "I know that God won't give me more trouble than I can handle ... but sometimes I wish he wouldn't trust me so much."